It's also a good reminder to change the batteries in your smoke and carbon monoxide detectors! For more information on this and other home safety tips, click here. 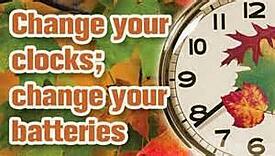 Remember, Change Your Clocks, Change Your Batteries!